Human behavior accounts for a significant chunk of domestic energy consumption. In fact, simple things like turning off the lights in empty rooms or setting the thermostat to 1-2°C lower during Winter can have quite an effect if they scale to a significant part of the population. The question then raised is, can feedback around one’s energy consumption lead to behavior change? If true, it leads to a cost-effective solution to environmental sustainability, next to the more expensive and slow in implementation infrastructural changes. Researchers in environmental psychology and energy policy have studied this question for over 30 years. Studies have repeatedly highlighted that simple periodical feedback (such as in the form of a monthly energy bill) on the household’s overall energy consumption leads to 10-20% decrease in consumption. In the field of HCI, we only recently became interested in energy feedback, and in particular the so-called eco-feedback technologies. 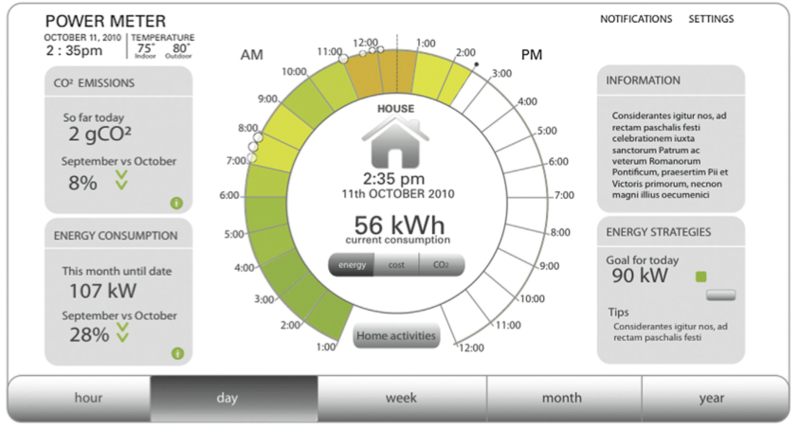 Such technologies present an advancement to traditional feedback strategies through providing a) real-time feedback (e.g., rather than once per month), and b) disaggregate feedback (i.e., characterizing the consumption of each appliance, e.g., through Non-Intrusive Load Monitoring, rather than the aggregate consumption of the household). SINAIS was a three-year project funded by Carnegie Mellon Portugal which sought to explore the potential of eco-feedback technologies for motivating behavior change. Together with Mary Barreto, who conducted her PhD studies at the University of Madeira, we inquired into the adoption of the SINAIS prototype, a smart energy meter that was installed in about 30 households for over two years. Mary identified an unexplored opportunity in the design of eco-feedback technologies: the role families have in influencing their members’ behaviors. She built upon a contemporary theoretical framework of social behaviors – Social Translucence – and proposed an alternative approach to behavior change: rather than studying technologies’ persuasive power over individuals’ behaviors, she focused on their role to increase the visibility of energy consumption behaviors among family members and to mediate communication and coordination practices among family members. Barreto, M., Karapanos, E., and Nunes, N. (2011) Social translucence as a theoretical framework for sustainable HCI. In Human-Computer Interaction–INTERACT 2011, pp. 195-203. Springer Berlin Heidelberg, 2011. Barreto, M. L., Szóstek, A., Karapanos, E., Nunes, N. J., Pereira, L., & Quintal, F. (2014). Understanding families’ motivations for sustainable behaviors. Computers in Human Behavior, 40, 6-15.